As per the report by TMR, the global on-the-go breakfast packaging market is expanding at a steady CAGR of 5.1% between 2017 and 2025. At this pace, the market’s valuation of US$743 mn in 2016 will reach US$1.1 bn by 2025. The global on-the-go breakfast packaging market has been segmented into rigid packaging and flexible packaging based on packaging type. Flexible packaging is the dominating segment due to the convenience associated with light weight packaging. It is expected to remain in the lead in the foreseeable future too. 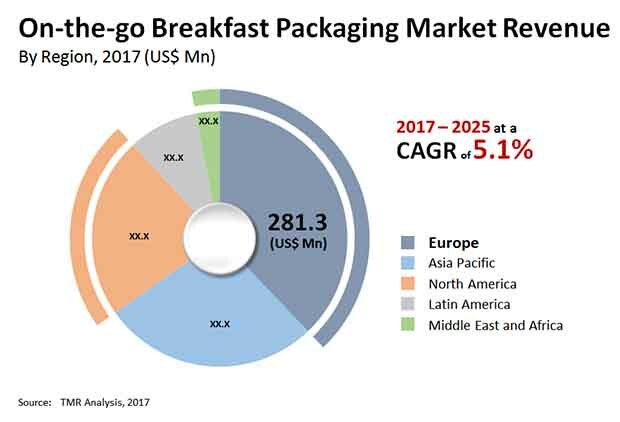 Europe stands as the leading regional market for on-the-go breakfast packaging, however, Asia Pacific is expected to display the leading CAGR of 5.3% between 2017 and 2025. The global on-the-go breakfast packaging market has been witnessing robust growth on account of several factors, which includes changing lifestyle of people, with more consumers preferring on-the-go food. Growing number of nuclear family set-ups in urban areas with both the partners working does not leave adequate time for home cooking on a regular basis. This is fuelling the demand for packaging for on-the-go foods. Another factor catalyzing growth of the on-the-go breakfast packaging market is the rising trend of large number of single persons moving out of home for work reasons. Due to time crunch they do not get much time to prepare first meal of the day, which is fuelling the demand for prepared breakfast options and indirectly benefitting the on-the-go breakfast packaging over the forecast period. Besides this, rising per capita expenditure on prepared food generally on account of rising purchasing power is also generating a high demand for on-the-go breakfast packaging market. With increasing trend of ready-to eat meals, the demand for on-the-go breakfast packaging is expected to continue over the forecast period. On the flip side, the growth of the on-the-go breakfast packaging market is negatively impacted due to several factors. Low level of awareness about on-the-go breakfast options among consumers in developing countries and adherence to traditional eating habits is posing a challenge to the growth of this market. Moreover, weak distribution networks for on-the-go breakfast packaged products in developing countries is a significant factor expected to impact the growth of the market over the forecast period. Nevertheless, availability of natural and organic on-the-go foods with additional health claims will present opportunities to the growth of on-the-go breakfast packaging market.